You can't have a spaceflight without a mission patch, even if the expedition is fictional. Warning: The following contains minor spoilers. In "Gravity,"director Alfonso Cuarón's new movie about astronauts (Sandra Bullock and George Clooney) stranded on a spacewalk, the attention paid to mission patches — of which there are several different designs in the film — exemplifies the level of detail that the filmmakers pursued when recreating the look of a real spaceflight. That meant that each of the hundreds of the props created for "Gravity," from large hand tools to the smallest bolt, each was painstakingly studied and designed. And you can see that when you look closely at the film's mission patches. Not that the fine details are ever steady on the screen long enough for close inspection, but as the emblems follow the characters throughout the movie, they too needed appear authentic. When "Gravity" begins, the audience meets veteran space shuttle commander Matt Kowalski (Clooney) and first-time astronaut Ryan Stone (Bullock). The two are performing a spacewalk — Kowalski is test flying an upgraded manned maneuvering unit (a jetpack) while Stone is servicing the Hubble Space Telescope. The spacewalkers are members of shuttle Explorer's STS-157 crew, a flight designation that Kowalski reveals while radioing mission control. In reality, the space shuttle missions ended at STS-135, and there was no orbiter named "Explorer" (there is a high-fidelity shuttle mockup in Houston that previously had that name, but it will be re-christened in a ceremony scheduled for Oct. 5, coincidentally the day after "Gravity" premieres in theaters nationwide). The STS-157 crew members — Kowalski and Stone, as well as Thomas, Dasari and Evans — wear a patch that features the shuttle, space telescope and the International Space Station (in the context of the film, the three share the same orbit — a creative liberty that Cuarón knowingly adopted for the story he was trying to tell). The patch borrows its basic design and visual elements (with the exception of the ISS) from a real NASA mission emblem, the insignia for the final Hubble Space Telescope servicing flight, STS-125. The emblem for the 2009 space shuttle Atlantis mission was oval, rather than circular, and omitted the Earth, but the influence is clear. As it happens, "Gravity" is not the STS-125 insignia's first connection to science fiction. "I contacted through a mutual friend Mike Okuda, who is the lead "Star Trek" artist, [to design the patch]," STS-125 astronaut John Grunsfeld told collectSPACE.com at the time of the mission. "So we have a 'Star Trek' connection with the mission." STS-125 didn't only inspire the "Gravity" STS-157 mission patch, but also the layout of the Explorer's payload bay in the movie. The filmmakers drew inspiration from the IMAX documentary "Hubble 3D," which used footage shot by the STS-125 crew in space. 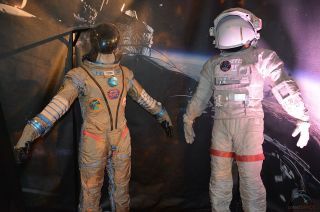 The shuttle's extravehicular mobility units (EMU) aren't the only spacesuits to appear in "Gravity." For reasons made clear in the film, Bullock's Ryan Stone also dons a Russian Sokol pressure suit, which introduces not one, but two additional mission patches. Cosmonauts and astronauts wear Sokol suits while flying aboard the Soyuz spacecraft that bring them to and from the station. As a result, they wear both a Soyuz patch and an emblem representing the space station expedition crew they are joining onboard the orbiting outpost. In "Gravity," the specific Soyuz mission designation never appears but the space station crew is Expedition 42. The real Expedition 42 is scheduled to begin in November 2014 with the arrival at the space station of Soyuz TMA-15M. The real Expedition 42 crew members include Barry Wilmore and Terry Virts of NASA, cosmonauts Aleksandr Samokutyayev, Yelena Serova and Anton Shkaplerov, as well as Samantha Cristoforetti representing the European Space Agency (ESA). As Stone (Bullock) was on the STS-157 crew, her name is rightly not listed on the "Gravity" Soyuz or Expedition 42 patches. Rather, the emblems list crew members Hayes, Villa-Lobos, Takemitsu, and a trio of Russian cosmonauts whose names are printed in Cyrillic. If the movie's Soyuz emblem was inspired by any real-life patch, it may have been the TMA-05M insignia from July 2012. The two patches share a similar orientation for their depicted Soyuz spacecraft and Earth artwork, as well as their use of orange and yellow as primary colors. The design influence for the "Gravity" Expedition 42 patch is much clearer: Expedition 20. The 20th long-duration mission to the International Space Station began in May 2009, five days after the STS-125 mission ended. Like the fictional patch that it inspired, the Expedition 20 emblem features the outline of the space station below a band of stars. Ironically, the real Expedition 20 patch was never sewn to a Sokol suit — the crew chose to wear the Expedition 21 patch instead. Continue reading at collectSPACE.com to learn about the other patches that appear in "Gravity" and to see more photos of the mission patches discussed in this article.